Secret Soldier is based on the film REBEL and distributed free for educational use through the National Park Service through streaming or through screenings at National Park sites. 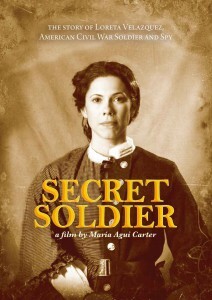 Secret Soldier introduces audiences to the riveting tale of Confederate soldier turned Union spy named Loreta Velazquez, who disguised herself as Harry Buford to fight in the American Civil War. She was dismissed as a hoax for a hundred and fifty years, but new evidence indicates Loreta, a Cuban immigrant raised in New Orleans, was one of an estimated thousand secret soldiers of the American Civil War. The film weaves lush dramatized scenes based on Loreta’s memoirs, with vivid storytellers, archival material and animation. Run Time is 18 minutes. Producers MARIA AGUI CARTER, CALVIN LINDSAY, JR.
How will this video be used?